1/2 mi N of I-24; LONG pull-thru sites-30/50 amp-upgraded wifi-cable-pool & dog park and dog wash station. Fish/boat on KY Lake & Lake Barkley; golfing nearby. Visit Historic Downtown Paducah and The Nat'l Quilt Museum! Hard to find a great park in this part of the I-24 interstate but this one worked for us. First time here and we would come back again. Site are typical length and width and we could stay hooked up with our 5th wheel. Road and sites are gravel and pretty level. People in the office were really nice and funny too. We did not use the bathrooms so no review. Dog walk in the back of the park is large but don't try and sit on the furniture, broken and bird doo doo all over them. No shade to speak of and it look like a lot of permanent sites. Road noise was noticeable but ok. Easy on off from the interstate. Easy in and out and close to I-24. Office/reception area was clean and organized. Interior roads are crushed stone with stone sites. We had a choice of sites so we picked out what we thought was the best of those available. Site was almost perfectly level. Park is a little cramped but there was room for us to park our tow vehicle. WiFi was great as was cable. There are some permanent campers residing. Noise from the road was very noticeable but did quiet down after midnight. Close to stores and sights in Paducah. Good park and great service. 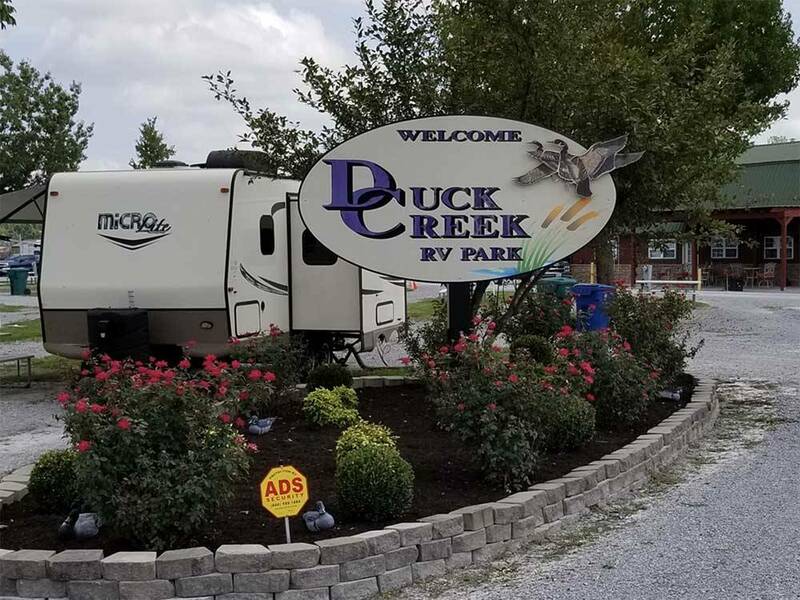 We have stayed overnight three times now at Duck Creek and love it! They are very friendly and helpful, the campsites are perfectly level, have a dog park, DirecTV, and it is on our way to visit family in Illinois. Their Wifi needs some work, which is fairly typical for campgrounds. Soon, we will come and stay several days and take in the local sites! Used this park twice for overnight stays when traveling. Very friendly person at desk, couldn't do enough to help us. The sites are extra long so we didn't have to unhook our truck. Restroom and shower is very clean and the water is hot with a lot of pressure. Very nice after a long drive. Picnic table at all sites as well as fire pit. Cable is great as well as the free WiFi. The road and sites are gravel, but very level. We sill stay again. We were the last night of a three week trip headed back to NC. We had traveled more than 10 hours and were really looking forward to a quite night of rest. In checking in I requested that we be put in the back behind the office away from the very busy highway. After I made my request the clerk was very rude and said there was no changing sites and that I was belligerent to him for asking. He advised me that I could leave and go somewhere else and continued to advise me that his day was bad. I left the office like a scorned dog. I told my husband what he said and he asked If I wanted to leave. I knew he was worn out from driving and said no we would stay. The traffic was all night long and trucks left the lot 5:00 am. Needless to say I would never recommend this park. Good luck to the new owners as they need to find pleasant employees for the front desk. Horrible sites - there is very little grass and all sites are gravel, making it difficult to level (we have automatic leveling jacks). The park is located next to an auto salvage yard which is very unsightly. It appears that some type of herbicide has been used along the fence lines and around the bushes/trees, causing concern for our pets. Will not stay there again. We were in the front row and the road noise was very heavy. We were very disappointed with this campground. The sites were all on one big gravel lot that's adjacent to a junkyard of cars. No picnic tables, no grass, just all gravel. Large, very noisy Trucks came in and out of the campground until almost 11:30 pm and started leaving again at 5am. The only good thing about this campground was that it was clean and away from the highway. But the truck noise within the campground took away from that one and only benefit. This was our first stay in a Good Sam endorsed campground and it was not a pleasant stay. Highway noise is so bad that we had difficulty sleeping, it appears that most of the sites that are away from the highway are long-term- stay use, indeed some of the rigs looked like they had been there for years. They should not be able to advertise free wi-fi - free is not a bonus if you are unable to use it, we couldn't even check our e-mail! If you are looking for a quiet relaxing get-a-way, this is not the place. Very disappointed in the campground and worried about staying at another Good Sam site. As RV parks go this one in great. The staff are extremely helpful and friendly. The park is very clean in all areas and the dog park is great as it offers lots of room to run and even a area for you to sit out of the sun while there. This isn't a woods/nature type park/campground. The lots are ok in size but are mostly gravel. Very little grass at each site. That shouldn't take away that this park is very nice, clean and friendly. Nice pool area and wash locations as well. Will gladly stay there again next time in town. The only reason it didn't get 5 stars across the board is the cable and Wi Fi signal was a little weak. Otherwise, very nice place. Great for an over night stay. Clean rest rooms, pools and shower. Staff was very friendly and walked us to our site to ensure all hook ups would work. All gravel and no shade. The primary advantage to this park is its location near Paducah. The site are gravel, with some trees and shade, generally level. The staff is very friendly and helpful and the pool area is nice.There is quite a bit of highway noise that continues well into the night. We stayed here for a couple of nights and we would likely stay here again. Stayed here one night on the way home. Large pull through sites where you can keep toad hooked up. Don't let the photos fool you, it is basically a large gravel parking lot with not much space between sites! Rest rooms were clean and the camp store had frozen food on site which was good because no restaurants in walking distance. I would not stay here again due to atmosphere. This park is convenient, which means it's close to freeway/highway and consequently you get a lot of noise. Spaces are tight but level. Restrooms are excellent. Wi-fi is good. Best of all, the park has a nice off-leash, fenced area for dogs with a pleasant place for dog owners to sit. 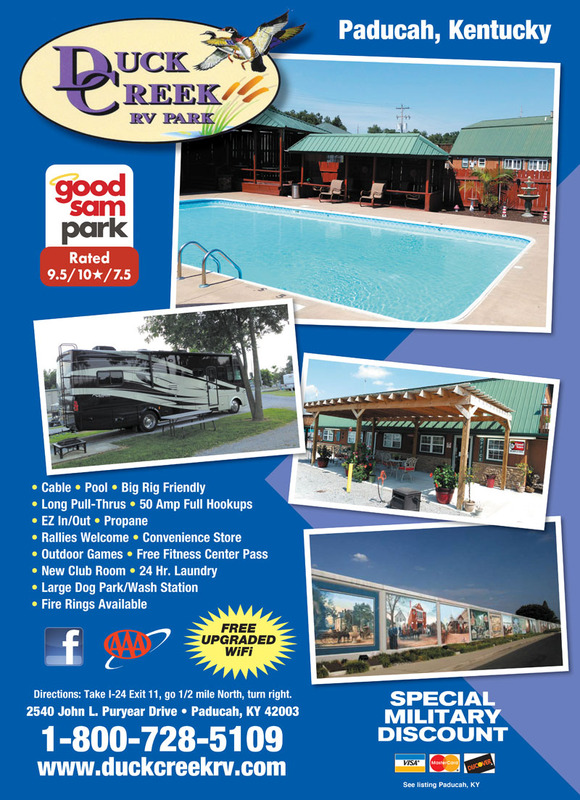 Clean and easy in and out campground on the outskirts of Paducah. Staff was very friendly and helpful. Very much enjoyed Paducah with it's history and good eateries along with a beautiful riverside park area. Nice pull through gravel sites. would definitely stay there again.